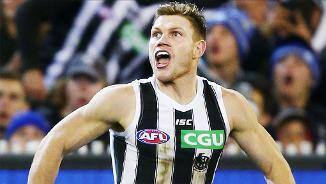 Collingwood midfielder Taylor Adams has played down his back-and-forth with former teammate Toby Greene during Saturday night's Semi-Final at the MCG. 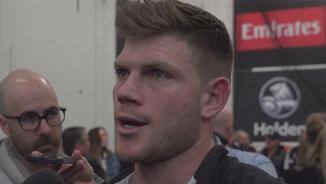 Taylor Adams has described the altered interpretation of the sliding rule as a "knee-jerk reaction", and believes it needs to be overhauled. Collingwood expects a host of key players to push for a return from injury when it approaches its clash with Richmond on Sunday week. Adams is the sort of player that loves winning the contested ball. Standing at 180cm, he thrives on the rough and tumble of life underneath the packs. A GWS Giant who was lured back home to Victoria in 2014, Adams enjoyed a solid first season as a Magpie, warming to the task as the year wore on and averaging 19.1 disposals and 2.7 clearances in 12 games. He quickly grew as a member of the Magpies' vast array of midfielders, underlined by his selection in the club's leadership group in 2016. 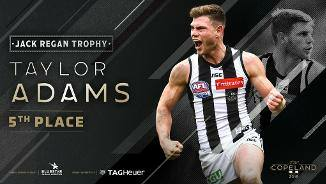 Adams' stature grew further last year, polling 14 Brownlow Medal votes and finishing a solitary vote behind Steele Sidebottom in the Copeland Trophy. Season 2017 was the high water mark of Adams’ football career to date. He played every match, for the first time in his six seasons, and finished one vote away from claiming the Copeland Trophy. A clear run with injuries made a big difference, but it was his appetite for the contest that continued to set him apart from his peers. Adams led Collingwood for disposals, clearances and contested possessions, and finished the year with 14 Brownlow Medal votes. He also laid a career-high 140 tackles, 50 more than his previous best in 2015. Adams’ finish to the season was particularly impressive, polling seven votes in his final five games. Now, with 97 games and six seasons under his belt, Adams is ready to take his game to another level again in 2018. Now one of Collingwood’s senior leaders, Adams enjoyed an impressive third season in the Black and White stripes. One of the hardest workers on the training track, Adams in February was named as one of five members of the Magpies’ leadership team. He told the Herald Sun at the time, “It is really rewarding to have it come from the playing group… There are some things I need to work on as far as my leadership goes, but I’m looking forward to learning as much as I can”. On the field, Adams continued to do what he does best – play hard, consistent football. Spending 14 games in the midfield, he averaged 27.7 disposals and 4.7 clearances per game, and had it not been for injuries, his output may have been greater still. He missed his first game in round six, before injury struck again in round 10. Nursing a hamstring concern, Adams was one of four Magpies left to watch on the sidelines as a bench-less Collingwood fell to the Western Bulldogs by 21 points. In round 16 he bounced back superbly, winning 30 or more disposals in his first four games on return. Unfortunately, playing the Western Bulldogs struck again in round 21. This time a rolled ankle ruled the midfielder out, an injury which kept him out for the remainder of the season. While Adams showed glimpses of his potential in 2014, his second year at the club in 2015 provided a substance that highlights the high value placed on him both internally and in the greater football community. Adams opened the season with an emphatic display against the Brisbane Lions. His highest possession total during his time at the club (31) set the tone for the year to come. It was a total that would be surpassed no less than five times in Adams’ 18-game season. His standout performance was a three-vote game in round 22 which produced 36 possessions and 12 clearances, while he also amassed 38 touches in round 15 against Port Adelaide. However it wasn’t just the sheer total of disposals that found Adams success in 2015. He led the club in contested possessions (11.7 per game) and was beaten only by Scott Pendlebury and Jack Crisp in the amount of tackles laid throughout the season. His ferocious attack on the football at times toed the line of aggression, and at the conclusion of round 15 he was suspended for two games for a clash with Port Adelaide’s Justin Westhoff. Upon return, he was substituted from the ground against Carlton in round 19, with questions of injury hanging over his head. These thoughts quickly disappeared as Adams re-emerged the week later to engage in what turned out to be the best month of his season. 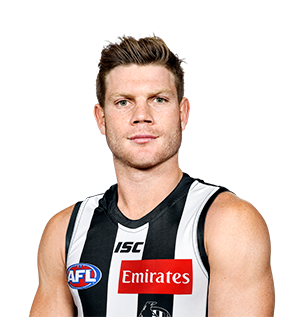 The four final games of Collingwood’s campaign saw the midfielder collect 128 possessions at an average of 32. This final month, plus the honour of finishing fourth in Collingwood’s best and fairest, will give Adams confidence to take his game to another level again in 2016. As the man involved in the deal that saw club hero Heath Shaw head to Greater Western Sydney, Taylor Adams was always going to receive his share of the spotlight during his first season at the Westpac Centre. Such is his maturity in both body and mind that it’s easy to forget that he only turned 21 on 21 September, but with 43 senior games under his belt, Adams is well placed to make a big impact in season 2015. He flew out of the blocks, collecting 31 disposals and seven clearances in the first match of the NAB Challenge against Geelong and did well enough in a practice match against Gold Coast several weeks later to earn selection against the Dockers in round one. After winning 15 disposals and four tackles in the 70-point loss, Adams was used as the substitute in the fortnight that followed and found himself suspended for his role in a collision with Geelong skipper Joel Selwood in round three. He returned via the VFL where he wasted no time in pressing his claims for a recall, gathering 36 disposals and six tackles against Coburg and a further 26 disposals and six clearances against Essendon at Windy. It was enough to earn another chance against Carlton in round seven, but Adams again dipped out of the side after collecting 16 disposals against the old enemy. He continued to hammer away in the state league, winning 32 disposals against Bendigo, backed up by another 32 against Geelong, resulting in a recall against St Kilda in round 11. Though he missed the Queen’s Birthday clash with Melbourne, Adams began to click as the second half of the year got underway. He won an equal career-high 30 disposals in the loss to the Western Bulldogs and from there on developed into a consistent performer in a team that started to lose its way. He won 24 or more disposals in four of his last six games, a run capped off with 28, seven tackles and five inside 50s in arguably his best game of the year against Port Adelaide in round 19. Unfortunately, just as his season reached its peak, Adams’ campaign came to an abrupt halt when a finger injury required surgery. Unbeknownst to many, Adams had played out the match despite tearing the tendon off the top end of the ring finger on his left hand. Managed 16 senior games, one more than he did in his first season as a Giant, and registered a career-high 30 disposals in the final game of the season against the Suns. Won more than 20 disposals in all bar four of his senior games and averaged 3.25 tackles and 4.0 clearances across the season. Signalled his intentions to return to Victoria at season's end and became a Magpie in a direct swap for 2010 premiership defender Heath Shaw. Adams took until round five to make his debut for the Giants, but was then a regular member of the side, featuring in 15 of the next 18 games. He brought a reputation for toughness to the AFL and did not disappoint, averaging 3.5 tackles to go with his 20 possessions a game, slotting in comfortably in the Greater Western Sydney midfield. A tough inside midfielder, Adams was taken with the 13th pick in the 2011 National Draft. Possessing a real determination to forge an AFL career, he averaged an impressive 28 disposals for the Geelong Falcons in the TAC Cup. Likes to bring his teammates into the play and has leadership credentials.